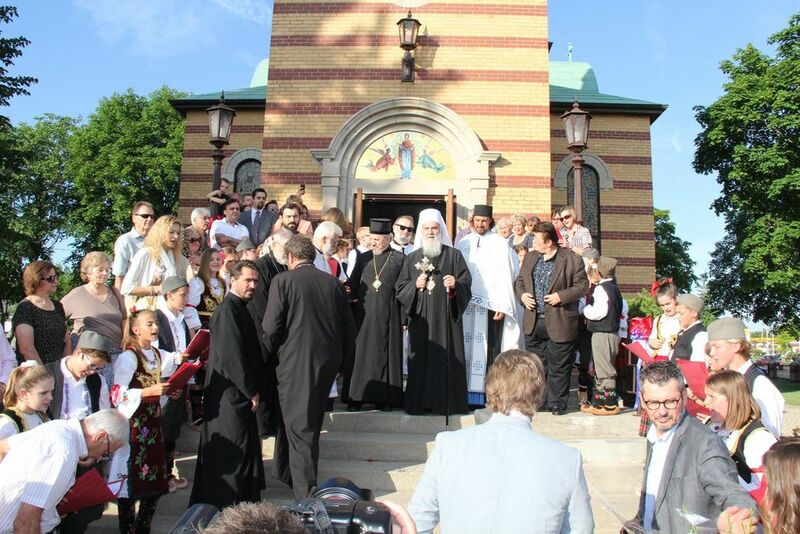 AT ASSUMPTION OF THE MOST HOLY THEOTOKOS CHURCH - "GRACANICA"
Windsor, Ontario - On Tuesday His Holiness Serbian Patriarch Irinej, administrator of the Diocese of Canada, visited the Assumption of the Most Holy Theotokos Church in Windsor after visiting the other Windsor church, St. Demetrius. The clergy from the Serbian, Bulgarian, Greek, Russian and Antiochian Orthodox Churches welcomed the Serbian Archpastor with many faithful. 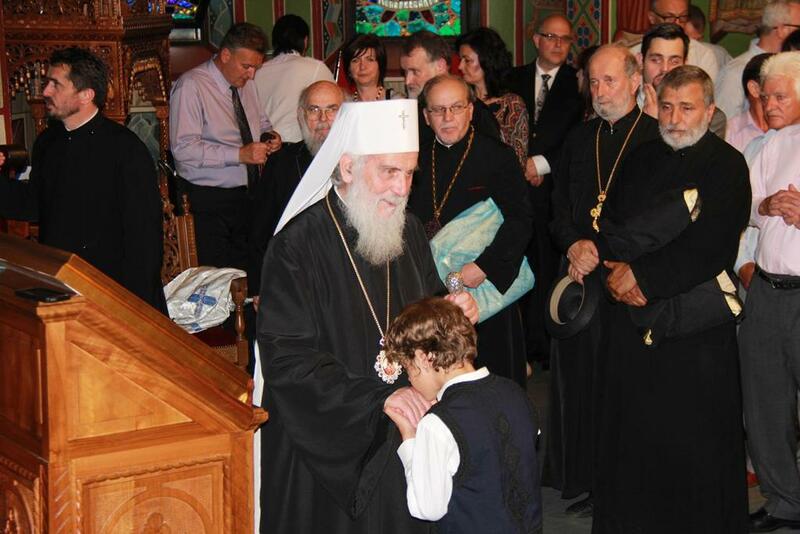 The youngest welcomed His Holiness with song, donned in Serbian folk dress, and greeting the patriarch with bread and salt. The welcome was beautiful. V. Rev. 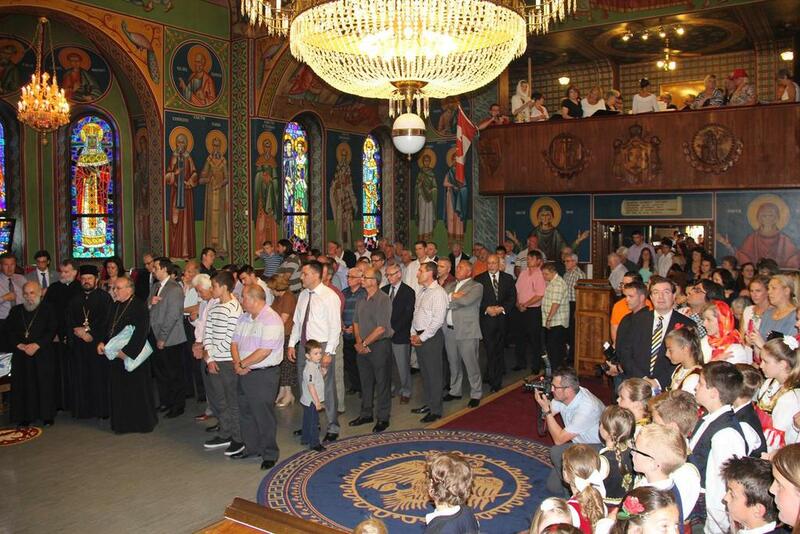 Milan Jovanovic and Protodeacon Damjan Bozic served Vespers. Afterwards, Fr. Milan, the parish priest, greeted His Holiness saying, among other things: "....This is a great blessing for us, and honor, that today we have the first hierarch of our Holy Serbian Orthodox Church, who brings us peace, unity and the blessing of St. Sava, on whose throne you sit and wisely lead our holy Church. Thank you for coming to visit us here in Windsor, in the parish of the Assumption of the Most Holy Theotokos, the beautiful church of Gracanica. Our church is not big, but for many years it has been the keeper and pillar of Orthodoxy and Serbdom in this region, and we hope it will continue. The people here are very cordial and hospitable, and they rejoice at your coming and God's blessings which you bring with you. We need blessings and peace since we have been split here in Windsor with divisions and discord, which is never in the spirit of Orthodoxy and the Way of St. Sava. We remember Your last visit to Windsor when we received you as our dearest guest. And now, for the first time, as Serbian Patriarch, the spiritual father of all Serbs, those who are still living in the homeland and those here who live in their other, blessed homeland of Canada. I greet you on behalf of this parish, the church-school congregation and all of the faithful people: Welcome, Holy Bishop!" The Patriarch stated that the beauty of the Orthodoxy faith is in the beauty of Orthodox worship, in the beautiful churches and monasteries and frescoes and the people who witness the faith with their lives. After Vespers Patriarch Irinej, accompanied by the parish priest V. Rev. Milan Jovanovic, visited the church nursing home located nearby. In the nearby banquet hall, owned by the Serbian Church, dinner was prepared in honor of His Holiness. In the attendance of over 500 people greeting the Serbian Patriarch was president of the church-school congregation Petar Dobric who, among other things, stated: "Today's day is dedicated to progess, our support of your very difficult decision and to you as our dear leader. 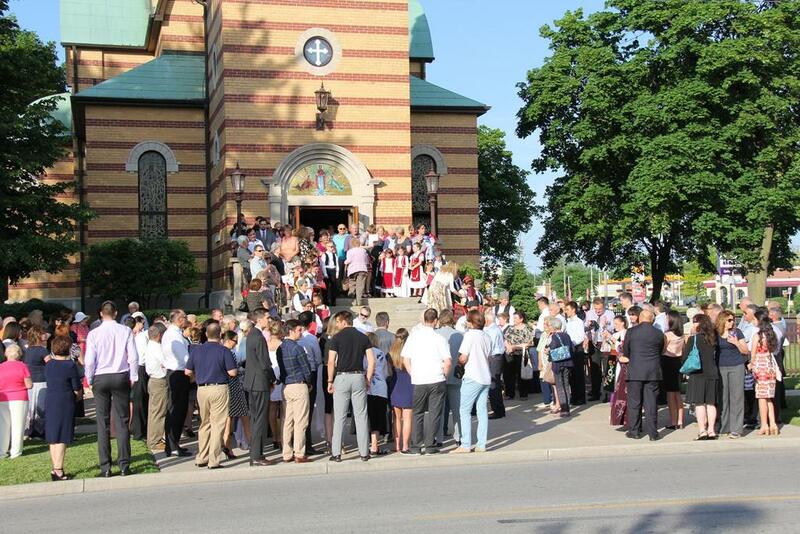 We, from Gracanica, as long time members of the Diocese of Canada, have consistently followed the path of preserving our spiritual heritage and traditions even during these difficult times...We understand that this is our greatest responsibility, but also duty.... 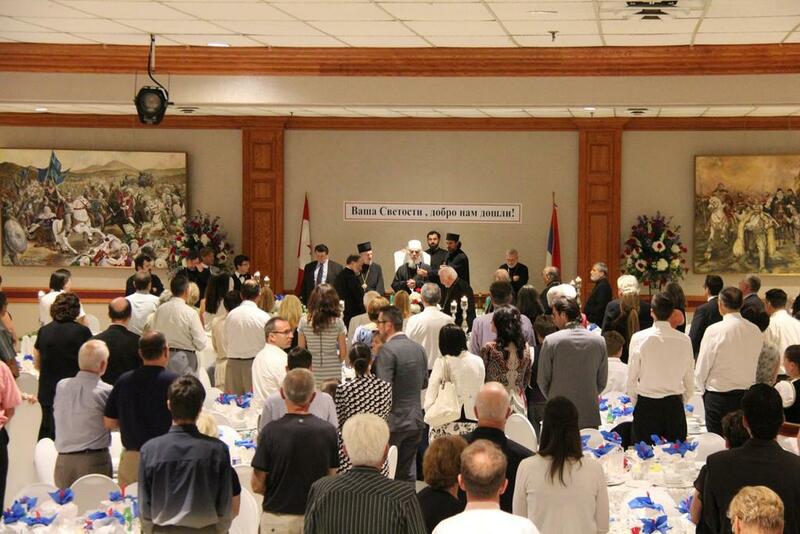 Your visit is linked for unity and you, with your visit, have shown your confidence in the Serbian community in Canada. We support you during this difficult time and wish you health, wisdom and peace!" Welcoming His Holiness was also long time parishioner and former church board president Djordje Velickovic. Among other things, he stated: "The committee which was recently sent by the Holy Synod confirmed that even though we are far away geographically we are still a part of it. Sincerity and impartiality of the members of the committee and the discussions which were led, showed that our work in preserving our faith and traditions are on the right path and that Your Holiness, together with our Hierarchs, care for that with strictness..."